Kew is a residential suburb 6 km east of central Melbourne, bordered on its west by the Yarra River and on its north by Earl Street and Harp Road, on its south by Hawthorn and on its east by Balwyn. In 1840 John Hodgson (1799-1860) took a squatting licence over Studley Park, on Kew's eastern bank of the Yarra River. Hodgson was born at Studley, Yorkshire (hence ‘Studley Park’), and his surname became a street name in a subdivision nearby. Hodgson's ‘Studley House’ in Nolan Avenue is on the Register of the National Estate. In 1851 Crown land sales in lots of between 15 and 80 ha took place in Kew. One of the purchasers, Nicholas Fenwick had his 495 ha estate subdivided into quarter-hectare blocks with streets laid out. He named the streets after English statespeople (Walpole, Gladstone, and so on), and the subdivision was named Kew, probably because its closeness to Richmond mirrored the relationship between London's suburbs of the same names. The estate was north-east of the Kew junction, bordered by Princess and High Streets. Access across the river was provided early in the 1850s by a bridge to Burwood Road, Hawthorn which resulted in Hawthorn being developed ahead of Kew. Nevertheless, two hotels were opened along High Street by 1854, one at the junction and the other, the Harp of Erin, at the corner of High Street and Harp Road. Congregational, Baptist, Primitive Methodist and Anglican churches were opened in 1854, 1855, 1856 and 1858 respectively. The Anglican church opened a school in 1856 and the combined Protestant churches opened one in 1859. It was replaced by a government school in 1870. Direct access to Kew was gained when the Johnston Street bridge was built in 1858. There is now a cluster of soaring churches edifices (Anglican, Baptist, Catholic, Uniting) east of Kew junction. 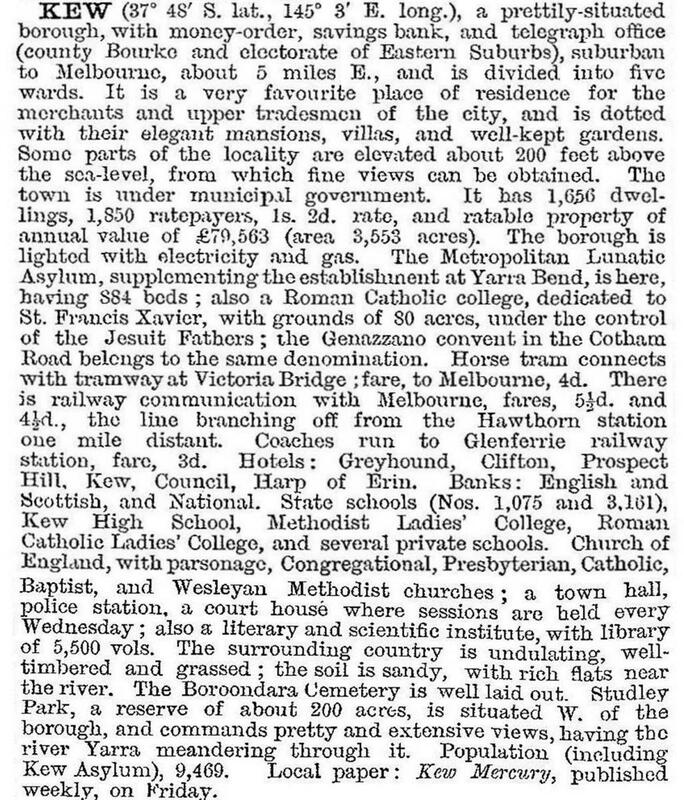 In 1856 the Boroondara Road Board District, comprising Kew, Hawthorn and Camberwell, was proclaimed. 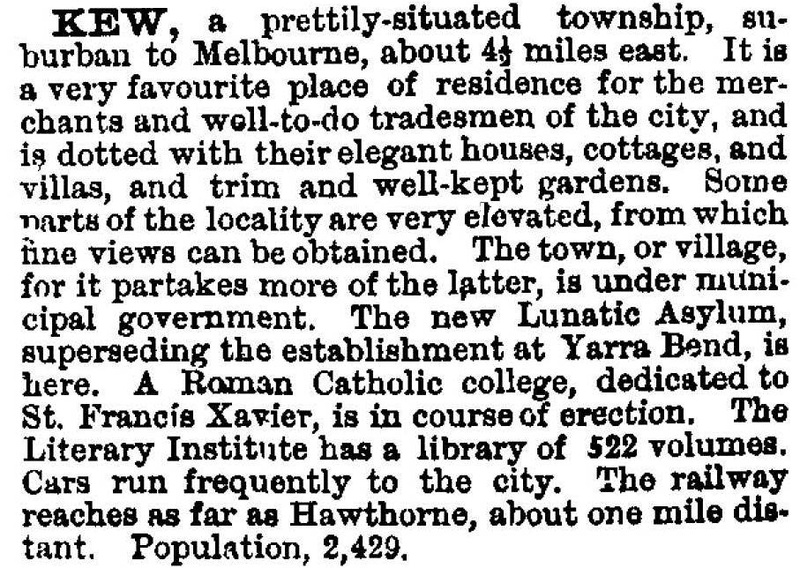 After Hawthorn in effect seceded from the Board in 1860, Kew acted likewise later in the year and was proclaimed a municipality on 22 December. It became a borough on 1 October 1863. In 1878 Kew gained the first of its numerous private schools, Ruyton Girls' School (Anglican) and Xavier College (Jesuit Fathers), which is on an elevated site with a domed chapel visible from several kilometres away. The Methodists Ladies' College (1882), Genazzano – girls, Faithful Companions of Jesus (1889) and Trinity Grammar (1902), which absorbed an earlier Anglican high school, are nearby. Later schools, also in the east-west part of Kew between Barkers and Cotham Roads, include the Sacred Heart Catholic school (1875), Carey Baptist Grammar (1923) and Preshill – The Margaret Lyttle Memorial School (1931). In the same east-west part, but closer to the river is Xavier College Preparatory school (Burke Hall). The result of this concentration of private schools in Kew was that in 1990 the municipality had six government campuses and 28 non-government campuses. The non-government school pupil populations were 15 times those of the government school populations. The board of Methodist Ladies College came under intense public scrutiny in 2012 when it sacked the school principal Rosa Storelli. The first public transport service in Kew was a horse tram from the Hawthorn railway station (1876). Ten years later a horse tram service was opened along High Street, from the Boroondara (Kew) Cemetery to the cable tram on the other side of the river. (The cemetery (1855) is noted for its elaborate monuments to prominent citizens.) In the same year a railway replaced the horse tram between Hawthorn station and Kew, and the spur line provided an often criticised service until 1957. The line ran along the west side of Xavier College terminating short of the Kew junction. The railway station site was later occupied by the Country Roads Board's headquarters. Its other station was Barker. Another attempt at providing public transport was the Outer Circle railway from Oakleigh to Fairfield. It entered Kew at Burke Road, about 500 metres north of Cotham Road, travelling generally north-west to the Chandler Highway bridge over the river. Most of the route is now a linear park. The Kew section opened in 1891 with stations at East Kew, Willsmere and Fulham Grange. It was so unsuccessful that passenger services were ended within two years. Trams proved to be more successful, with services opening along High Street, Cotham Road and northwards along Glenferrie Road to the private schools' area between 1913 and 1915. The Burke Road tram opened in 1918. High Street developed two strip shopping centres, the main one east of Kew junction and the other near the Harp Hotel. A minor landmark near the Harp Hotel, on land formerly occupied by the Outer Circle, is a wood yard. Each year before winter, a newspaper can be relied on to feature the yard's wood pile, acknowledging the preference for traditional woodfires in Kew's comfortable homes. Between 1910 and the outbreak of World War II Kew's population approximately tripled. It was proclaimed a town on 8 December 1910, and a city on 10 March 1921. In 1939 Kew’s second Anglican church, St Hilary’s timber hall (1888) was replaced with a large brick building. There was scope for postwar housing growth, in outlying areas near Yarra Bend Park and around Stradbroke Park to the north-east. Over the road from Kew's boundary Coles-Dickens opened their first supermarket at the corner of Burke and Doncaster Roads in 1961. Kew is generously provided with parks. Alexandra Gardens is in the original village and a larger reserve with the cricket ground is next to the cemetery. On a much larger scale the colonial government reserved the Yarra Bend Park and Studley Park (1877) adjoining the Yarra River. Yarra Bend was the site of the first asylum (hence the pejorative expression ‘gone around the bend’). Both parks retain much of their original bush land, although part of the park in Kew has had an excision for a golf course. (The part in Fairfield on the other side of the river has had larger excisions for a larger golf course, ovals, infectious diseases hospital and a women's prison.) 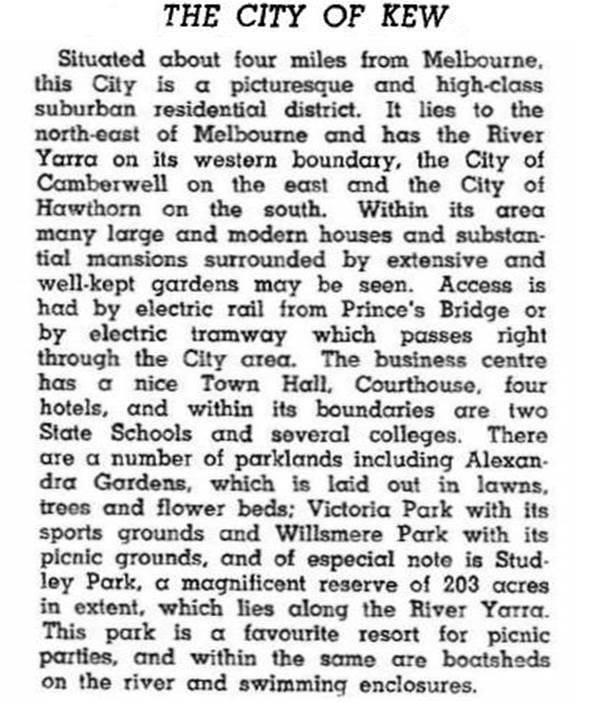 The scenic Yarra Boulevard (1936) runs through the park. The shopping centre east of the Kew junction contains a landmark post office (1888) and war cenotaph (1925), passed on either side by tram lines. The congested site saw the postal activity removed – mail sorting to a more functional site and retail sales to a shop. The post office became the QPO restaurant, and is on the Victorian Heritage Register. Compared with similar suburbs such as Caulfield and Hawthorn, Kew has had fewer of its fine house allotments redeveloped for flats or row houses. Distance from public transport has made much of Kew unattractive for flats. In west Kew there are three notable heritage-listed mansions: Villa Alba (1863, 1883), Studley House/Burke Hall (1857), and Raheen (1870, 1884). Willsmere, never a mansion but of grandiloquent proportions, was de-institutionalised for apartments. The Kew Cottages complex also came under medium-density residential development. On 22 June 1994, Kew city was united with Camberwell and Hawthorn cities to form Boroondara city. Kew's civic offices become a customer service centre. At the 2011 census the median income of Kew’s residents was 50% above the Victorian median. Boroondara Council became one of the first in the country to ban smoking in public places in 2012, when it banned smoking in playgrounds, bus and tram stops, sports grounds and all council buildings in Kew.